Favorite Travel Destination : New York - the lights, the sounds, the shows! I loved every minute of it! Training Philosophy : Wake up, Workout! Advice or Tips to other KMM members : Create space in your busy life to invest in YOU. What keeps you coming back season after season? 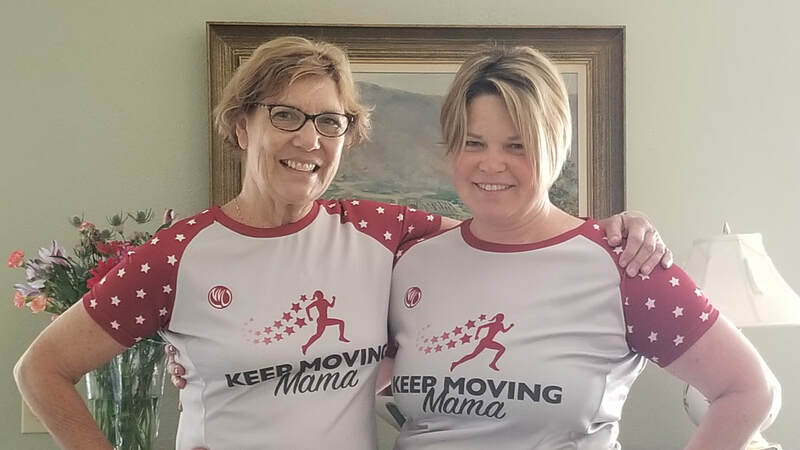 : The amazing feeling of exercise, Wendy’s positive and encouraging attitude, and the community of momma’s that cheer you on along the way. Training Philosophy : Get it done before anything else; planning promotes the best success. Advice or Tips to other KMM members : Exercise only happens when it is scheduled. There will always be something else that is “more important” if you don’t make it a priority. What would people be surprised to learn? 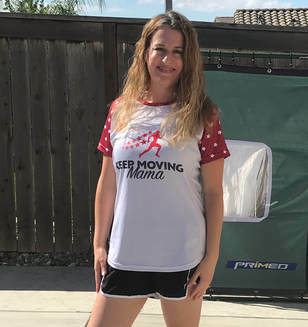 I ran 5 marathons from 1997-2002 and walked one in 2006 when I was still breastfeeding my 6 month old. I had to pump right before the start and was DYING 6 hours later when I finally got back to my car. What motto do you live by? : Take advantage of every opportunity because you never know what may come of it. 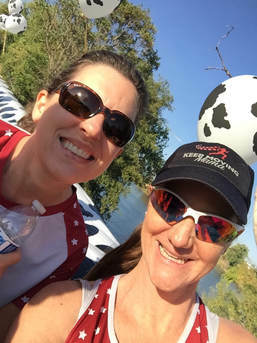 Kristen (left) and Wendy (right) taking a selfie after Urban Cow in 2017. Training Philosophy : Do your best and don't compare yourself to others. Advice or Tips to other KMM members : Take care of yourself first so you can do your best taking care of everything/everyone else. What would people be surprised to learn? I was a New Wave/Goth girl in high school! What motto do you live by? : Live and let live. What keeps you coming back season after season? : The support, camaraderie, fun and taking guilt-free time for myself. Training Philosophy: An object in motion tends to stay in motion. Advice or Tips to other KMM members: Just don’t ever stop. It’s so much harder physically and mentally to re-start. What would people be surprised to learn? : I once rode my bike across the state of Iowa in six days. What keeps you coming back season after season? : The camaraderie of the woman, all the laughs and the sense of a being part of a team. Proudest Moment : Being the first person to graduate from a four year university college in my family. Training Philosophy : working for it not wishing for it. Advice or Tips to other KMM members : Consistency is the key to success. What would people be surprised to learn? I love my alone time. What motto do you live by? Do what makes you happy. Life’s to short not too. Childhood Ambitions : Always knew I wanted to be a teacher. Advice or Tips to other KMM members : Believe in yourself and don’t give up. What would people be surprised to learn? I was a makeup artist in college. What motto do you live by? : With hard work and determination anything is possible. What keeps you coming back season after season? : The positive encouragement from everyone and commitment to the teams. And for the GIRL POWER!